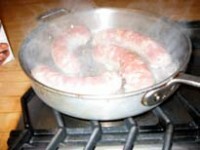 ENZO’S at the new San Francisco Ferry Plaza Market has fabulous sausages. 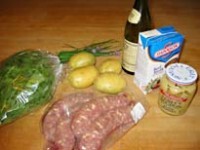 Here is a simple supper dish to make with these sausages and the produce of spring. To cook the potatoes, cut them in half if large, and put them in a saucepan covered with plenty of cold water. Add half a teaspoon of salt and bring to a boil. Simmer until the potatoes are tender when pierced with a fork, about 30 minutes. Drain onto a colander and shake to evaporate the excess moisture. When cool enough to handle, slice the potatoes and put them into a bowl, toss gently with olive oil, chives, and salt and pepper to taste. To cook the sausages, prick them in several places, and put them in a 10 inch saute pan with about 1/4 inch water over medium high heat, turning them from time to time and adding water if they get too dry. When they are lightly golden on all sides, remove from pan. 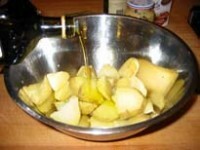 Immediately, pour in the wine to deglaze the pan, and pour the wine mixture into a salad bowl. Slice the sausage in 3/4-inch slices. To the salad bowl, stir in the shallot, mustard, and a tablespoon of olive oil. Toss the arugula in this dressing. 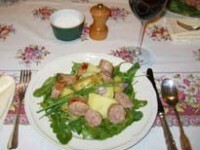 Arrange the dressed arugula around the bottom of 4 warmed salad plates; pile potatoes in the middle of the arugula; and arrange the sausage around the potatoes. Decorate with additional chives.